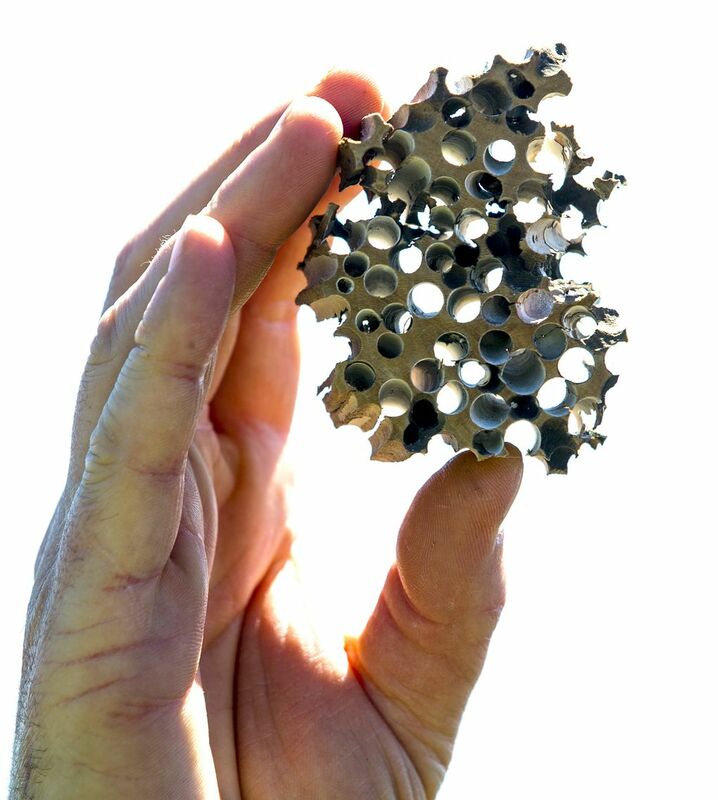 It’s known as wormwood, but the intricate designs are actually made by shipworms, which are really clams. 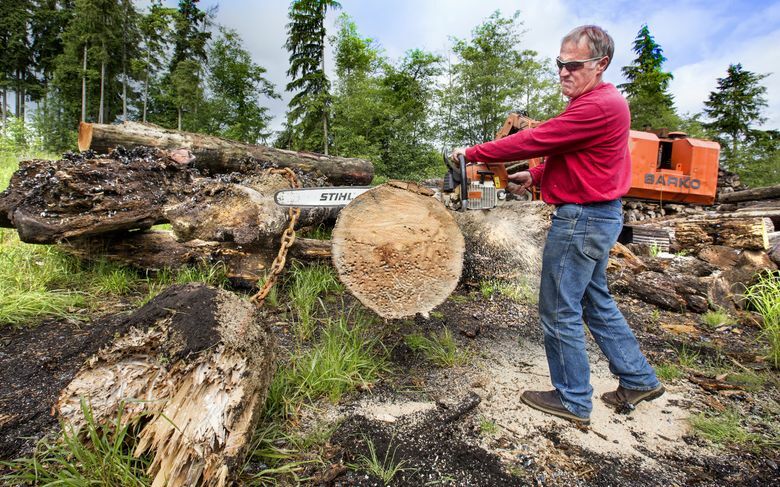 THE NIGHT THAT got Bill Sibbett started down a very crooked path toward clam-powered, waterlogged-timber-reclamation greatness was dark and stormy. Sorry, but it was. The Sibbetts were hunkered down at home, which is what you do in Indianola when the winds are 50-knots angry and the seas are spitting like an old drunk guy who got left at the dock by the last Kingston ferry. It was 2 a.m., give or take. Bill Sibbett was awakened by a spotlight flash from the water. He looked west and saw a tugboat, straining to keep a large raft of logs off the beach. Not so successfully; in the morning, three bundles (about 10 logs per) of the logs were sitting in front of Sibbett’s house. Sibbett, a commercial fisherman and sometimes-tug-driver himself, tracked down the tug crew — in the greater Kingston/Port Gamble/Indianola/Suquamish quadplex, everybody knows everybody — and told the guy: Hey, I can get some friends to take our bowpicker boats out and grab the logs and float them back to you. It was the maritime-neighborly thing to do. The Foss tug had lost three quarters of a million dollars’ worth of high-grade Japanese export logs — some 3,600 of them — in the storm. Sibbett recruited a friend from Suquamish who had a similar, often idle, commercial fishing boat. Together they yarded 3,465 logs out of Puget Sound around Jefferson Head. Sibbett had found a niche: The shallow-water work was too small for tugboats; the bowpickers’ winches were plenty powerful enough to haul in logs that are essentially of neutral buoyancy. This was in 1987, and it created some nice pocket change. A month later, back on the Columbia in search of a few chinook, Sibbett got a call: another log spill. The boomsticks Sibbett learned how to handle would, in succeeding years, create a firm link between him, some possibly alien wood-boring creatures, Sir Francis Drake, Christopher Columbus and rich people’s fireplaces in Hunt’s Point. A BOOMSTICK, for the non-barnacled among us, is not a Fourth of July pyrotechnic device sold at the Ill Eagle fireworks stand on the reservation. 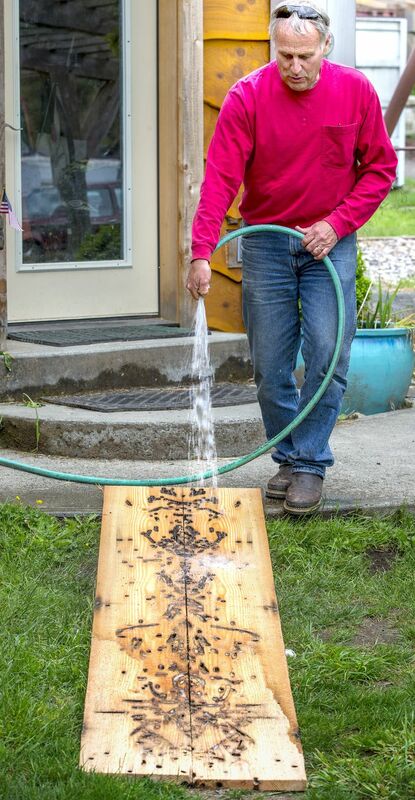 It is a simple flotation device — a 50-to-75-foot-long retaining log, usually Douglas fir or hemlock. It is chained to other boomsticks to encircle a “raft” of logs that can be pulled behind a tug. A raft typically carries 60 to 90 bundles, or log-truck loads, of timber. You used to see these all over Puget Sound, because it was, and still is, a cheaper way to pull downed timber from one place to another. Today, only a couple tug companies are still in the business. Why, yes, I am, he said. Not a problem, said Sibbett, who, having spent most of his life striving to stay above the surface, of course knew absolutely nothing about recovering logs underwater. But he had a college roommate who was a cold-water diver. He called him, and they worked up a system to set floating chokers. Steve Ladd, his friend, would dive and set the chokers to individual logs; Sibbett yarded them up and hauled them to the beach. 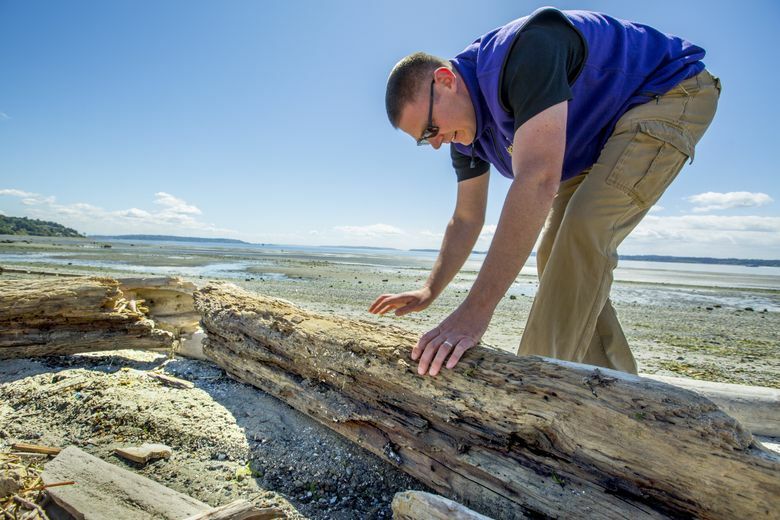 Jeff Adams, a Washington Sea Grant marine ecologist from the University of Washington, looks for wormwood along the beach at Discovery Park near the West Point Lighthouse. Teredo lumber, often called wormwood, is being milled from decommissioned log-booms. Wormwood is created by a â€œshipwormâ€ clam, Bankia setacia or the Teredo clam. They attach themselves to logs as larvae and soon begin drilling into the interior. Once inside a tiny entrance hole, the clam starts boring with a technique not unlike a modern tunnel-boring machine. Photographed on May 19th, 2016. 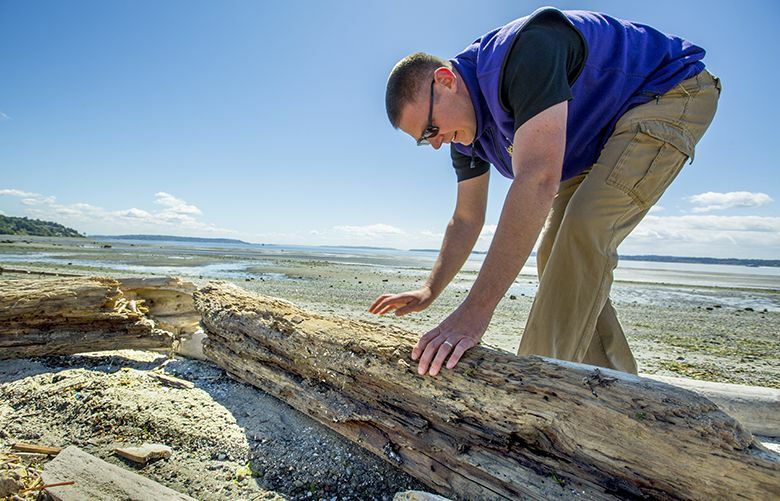 Before they knew it, they had recovered 80 log trucks full of submerged logs, and Port Gamble’s log pond was miraculously 25 feet deeper. Word spread; he got calls from other mills. Very quickly, his little business expanded, filling up idle time when he wasn’t fishing in Alaska. It paid the bills, which were about to become astronomical. Sibbett figures he lost about $860,000 when his fishing business was wiped out by the Exxon Valdez oil spill in 1989. Afterward, he turned to log recovery as a more full-time, creative replacement job, using his old equipment. By 2001, the Sibbetts had managed to pay off their debts and get their heads above water. And kismet was about to strike. As Sibbett and Ladd worked up and down the coasts of Washington and Oregon recovering timber, mill operators and tugboat contacts started asking: Hey, since you’re taking old logs, we’ve got a bunch of old boomsticks here. Want those? Why not? Sibbett initially thought they could be sold for pulp. But pulp-mill operators turned up their noses. So Sibbett started stacking them up around Kingston and selling boomstick logs for stream-rehabilitation material. Using log-handling gear he picked up on the cheap from conventional loggers fading out of business, Sibbett reinvented himself into a sort of specialty forester who never cut a single tree. Enter now the clam, finally the clam. The logs, some of which have floated in saltwater for decades, have too much metal in them, and too high a “protein” content from all the attached sea life, to qualify as decent pulp-mill stock. Most people considered them landfill material, at best. One day Sibbett was chain sawing off the ends of some boomsticks when a thought struck: Why not haul some over to his friend Paul Smyth, who runs a small-scale lumber mill in a converted horse arena right in Indianola, and see what kind of funky lumber they could make? Sibbett actually knew what he would find: timber laced with intricate, blackened tunnels, about as big around as a fat pencil. Anyone who has cut open a beach log has seen this maze of tunnels: the former home of a diligent aquatic creature — the shipworm. Wood so infected is commonly known as “wormwood,” and it has its own special, often-reviled, place in world history. 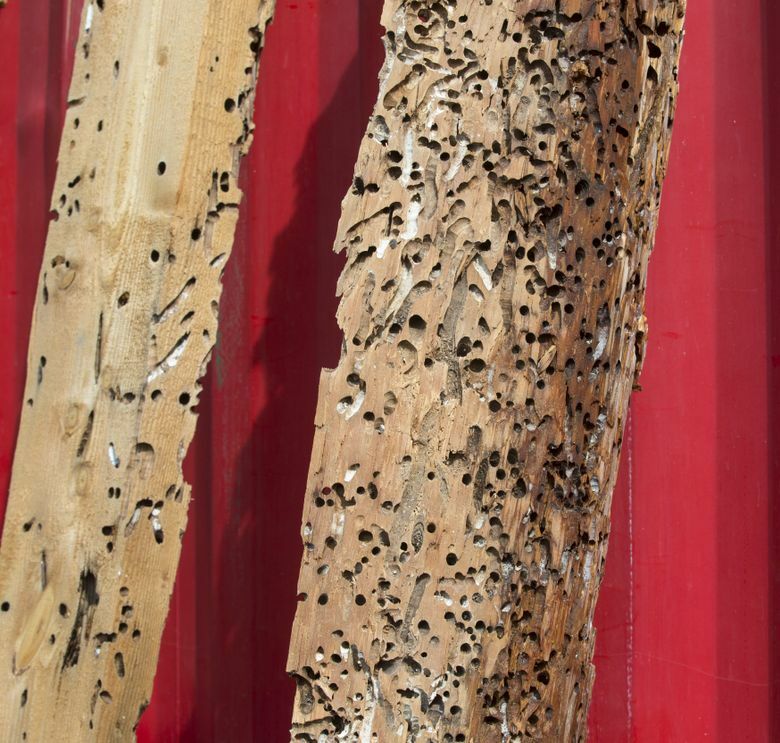 Shipworms, oft referred to as the “termites of the sea,” are prolific tunnel-borers that can turn the soundest wood pier, sailing ship hull or whatnot into perforated mush in very little time — not the optimal situation when the wood is literally keeping you afloat. The marine-biology punchline to this story is that shipworms are not worms at all. They are clams. Clams! (Be still, resting heart of the late Ivar Haglund.) In the case of Columbus and most Atlantic-based explorers, specifically the Teredo clam, Teredo navalis. They don’t look much like bivalves of the happy-hour-appetizer variety, nor act like them. But wood-boring clams have long lived in and feasted upon logs beached or bobbing in the Salish Sea, where a close cousin of the Teredo clam, the native Bankia setacea, AKA the feathery shipworm, or Northwest shipworm, reigns supreme. These clams have quietly existed in saltwater for hundreds of millions of years. And they have made an indelible mark on human history, hitching rides on sailing ships and making themselves the scourge of shipbuilders and timber mavens around the globe. 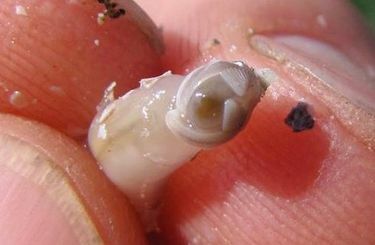 THE NATIVE shipworm clam, Bankia, ranges from Alaska to San Diego. They attach themselves to logs as larvae measuring about 1/100th of an inch, and soon begin drilling into the interior with their bivalve “shell,” which forms a double-edged-disc-carving tool at the front end of the animal. Once inside a tiny entrance hole, the clams start boring with a technique not unlike a modern tunnel-boring machine, except without the lawsuits and cost overruns. They are filter feeders, but some portion of the wood is consumed as it is broken down in the clam’s body. 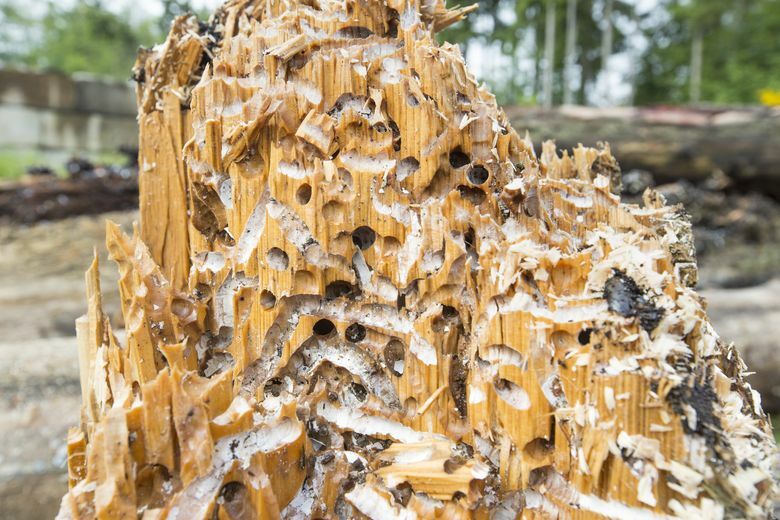 This process, it turns out, might be unique in nature, and could contribute to a scientific breakthrough: Bioenergy researchers are studying the Puget Sound Bankia’s unique ability to produce its own enzymes to break down wood — a possible key to industrial production of advanced biofuels. As the clam tunnels — always with the wood grain — it grows forward. Fast. Bankia reach full size of up to 4 feet long in as little as one year, Adams says. The wood becomes, in effect, its exoskeleton. The clams must bore, grow and die before their host log falls apart and exposes them. When they pass to the great clam beyond (beneath? ), they often leave behind a calcified white shell, a lining for the tunnel they had inhabited for years. Presumably the highlight of a Bankia’s life is its spawning stage, accomplished in a no-nonsense way without leaving home. 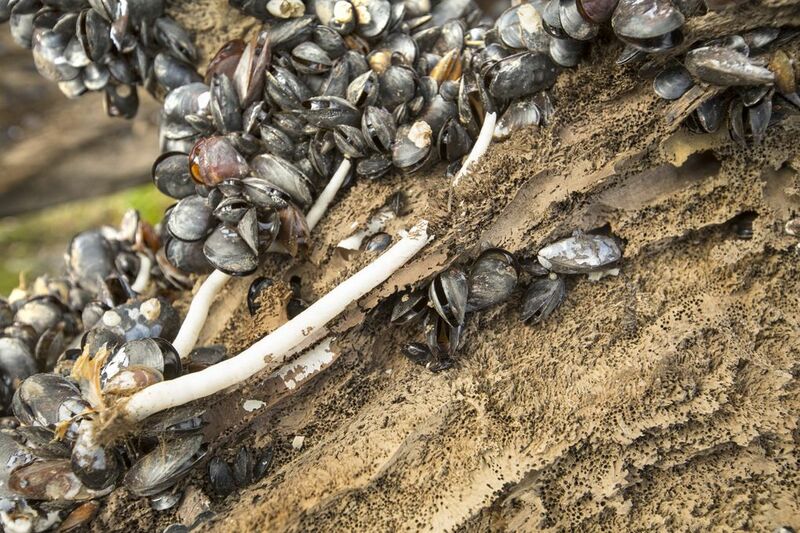 A change in ocean conditions spurs all the clams to release eggs or sperm into the water around a log, Adams says. Females of the Teredo variety actually bring sperm in — trigger alert: The following part of this sentence is rated PG-13 — “through their incurrent siphon, and fertilize and brood their young inside their body” to be released later, Adams says. The first time Sibbett saw “bookmatched sets” of boards cut from boomsticks — consecutive slices, laid side by side, to form a mirror image of the clam trails — the patterns took his breath away. “It was like a thunder egg,” he says. Ugly on the outside. Otherworldly within. 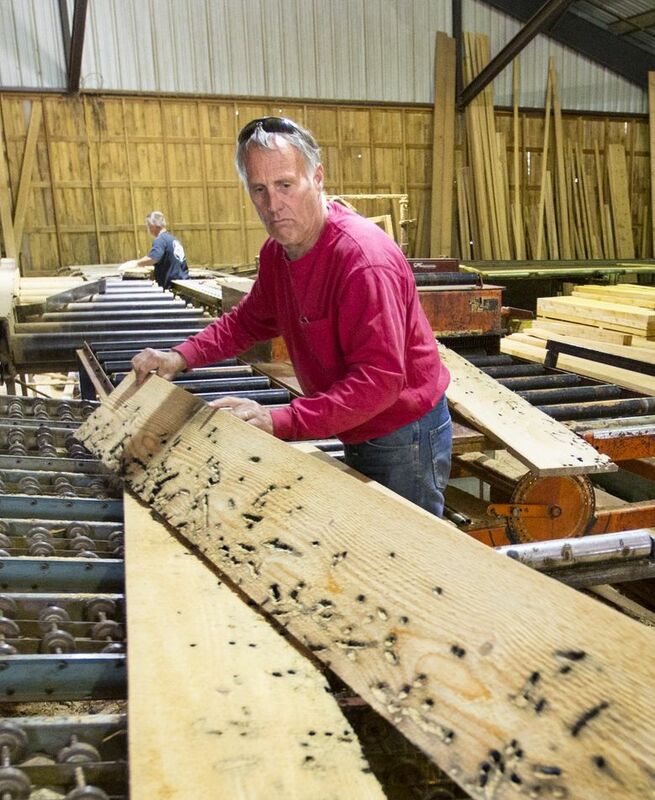 It has taken time, but the lumber produced by Sibbett and Smyth at the Indianola mill has in the past few years caught the eye of many a craftsman, custom homebuilder, artist or homeowner seeking a distinctive look. 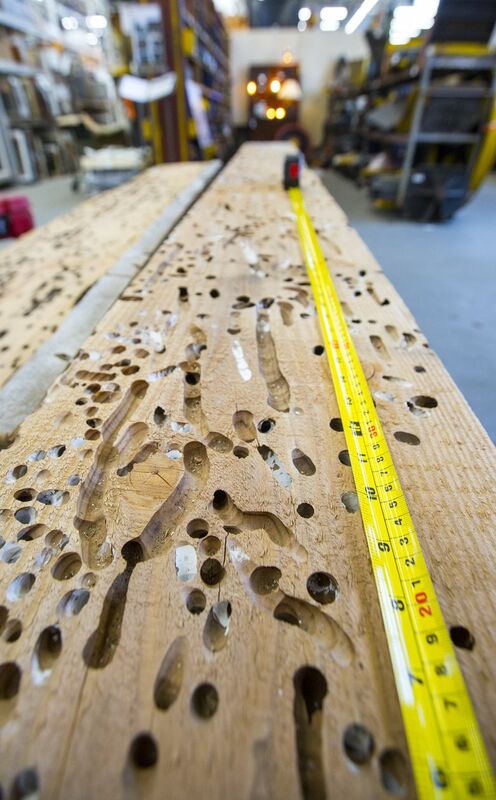 Wormwood boards cut into thick planks make spectacular fireplace mantels. Cut into tongue-and-groove siding or flooring, they offer a distinctive, natural look to interiors. Sibbett calls his version Teredo Lumber, and believes he is one of the few people in North America producing it on a regular basis as a raw wood product. 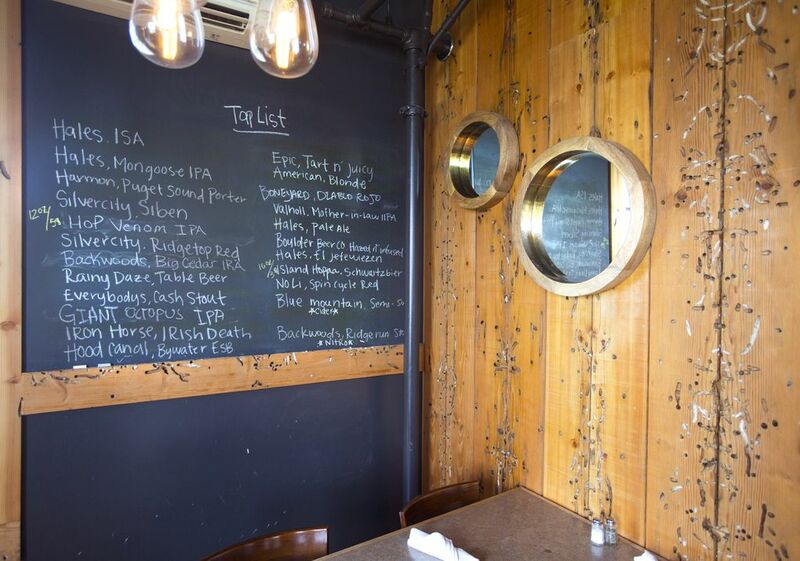 Today you will find it on the walls and floors of places like the Port Gamble Café; the radio station KEXP stage; and homes owned by people who love the fact that the wood, besides being beautiful, comes with its own quirky nature story. 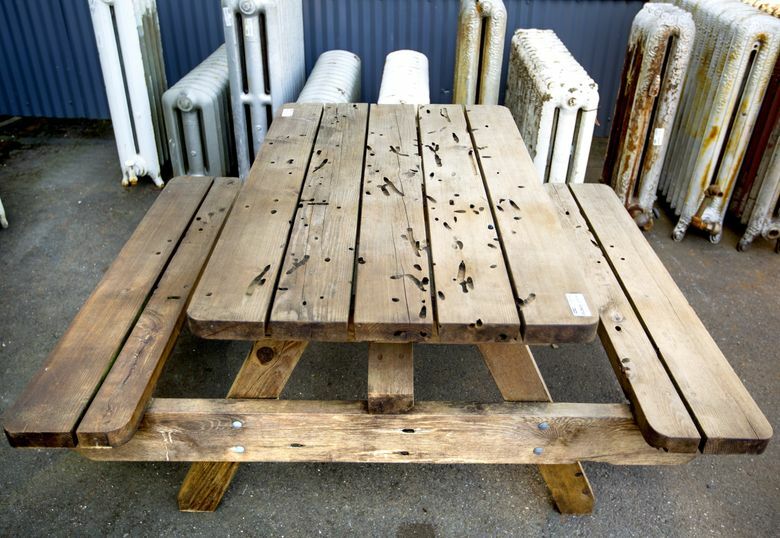 The pieces are selling well at Issaquah Cedar & Lumber and Seattle’s Second Use building materials store, where 1×14 rough-cut boards from Sibbett’s reclaimed logs sell for $5.85 per linear foot. 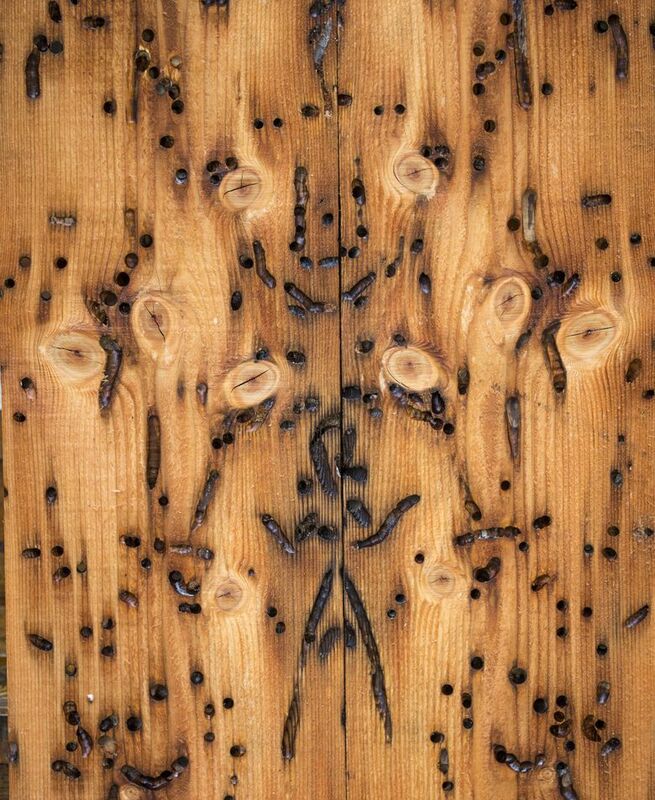 Bookmatched sets of clamwood Douglas fir 1×12 boards with unique mirror-image patterns are selling for $100 or more, mantel pieces up to $400. Sibbett quickly learned to make smaller pieces, as well. “Anything that fits into a Prius, we sell like crazy,” he says. He is amassing an inventory of the best bookmatched sets in “the dry kiln that used to be our garage.” His collection includes some 300 pairs, many forming patterns that appear to be truly clamtastic works of art. He shows off one where the clams have unwittingly etched out a sea turtle; another the stick-figure image of a juggler, with a series of tree knots above its head serving as balls in the air. And so on. That, he says, is the magic of the wood — and why it’s catching on among people who increasingly appreciate ordinary objects that come with a unique story. “It’s interdisciplinary mishmash,” Sibbett says of the wood, and his new occupation: a product of the accidental genius of nature. Really, the wood represents everything Sibbett has always loved about the Northwest, all in one simple, mill-run package. And if he can put that right in your face, on a wall, or under your feet, via flooring, so much the better. At this point, it’s basically working out for everybody. He has a long way to go, but Sibbett is chipping away at what amounts to a lifetime bad rap for the quirky little clams. He might prove to be the guy the wood-boring clam has spent 500 million years patiently waiting for. If buyers do their part, Sibbett will do his. The clams, he points out, already have.